Assist partners with broiler and turkey producers to examine all aspects of the grow out process. Assist helps producers correct toxic issues in poultry drinking water by targeting the removal of sulfates as well as various heavy metals such as iron and manganese in both well and municipal water sources. We understand the critical need to adjust and monitor pH of the drinking water in order to provide optimal conditions in the gut. Assist’s products create safer environments for grow out by reducing or eliminating hazardous ammonia odor problems with OMRI Certified litter amendment products as well as environmentally safe hard surface cleaning solutions for barns and equipment. In addition to its focus on drinking water, Assist provides sound probiotic solutions which promote healthy microbial populations in the gut. This step is critical for “rebalancing” the gut resulting in better livability, enhanced weight gain, and increased feed efficiency. 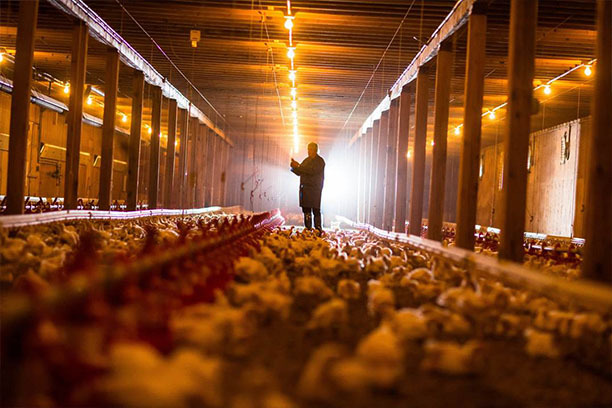 For more information about poultry success stories, click here. Water Filtration uses innovative and unique technology to effectively clean and treat your drinking water system. Water Treatment uses innovative and unique technology to effectively clean and treat your drinking water system. Line Cleaning uses innovative and unique technology to effectively clean and treat your drinking water system. Viribus is designed to support the health and performance of the bird, and maximize lifetime feed efficiency by supporting gut development at placement. IMP for Poultry is a high concentration of amino acids, trace minerals and direct-fed microbials. Acidifier is designed to improve growth, performance, and reduce pathogenic bacteria in the gastrointestinal region. Fortify Plus is a formulation with a select blend of Direct-Fed Microbials and trace minerals that optimize digestive functions and naturally enhance the immune response. Cyclone is developed using high-performance surfactant technology with proprietary enzymes which emulsify feces, urine, grease, fat, and excess feed. PIT Perfect is a blend of targeted amino acids and natural emulsifiers that can make lagoon maintenance and pit cleanout less time-consuming. Relentless is derived from all natural ingredients to increase biological activity and competitive exclusion. Defender is an all-natural, concentrated liquid that provides rapid ammonia control and pH reduction..